Listen to "Think and Grow Rich 1 of 7" on your iOS and Android device. ""...reading this book is bound to inspire you to take a more positive approach to life."" ""For inspiration, read...'Think and Grow Rich! '....It's the first step to devising a winning strategy."" Think and Grow Rich is a motivational personal development and selfhelp book written by Napoleon Hill and inspired by a suggestion from ScottishAmerican businessman Andrew Carnegie. While the title implies that this book deals only with how to achieve monetary wealth, the author explains that the philosophy taught in the book can be used to help individuals do or be almost anything they want in this world. For instance, Jim Murray (sportswriter) wrote that Think and Grow Rich was credited for Ken Norton's boxing upset of Muhammad Ali in 1973. The book was first published in 1937 during the Great Depression. At the time of Hill's death in 1970, Think and Grow Rich had sold 20 million copies. 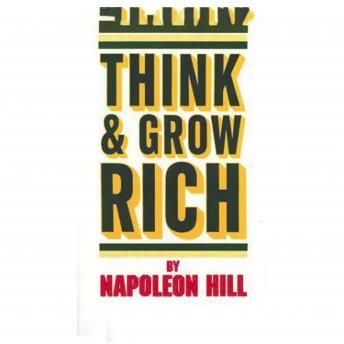 It remains the biggest seller of Napoleon Hill's books a perennial bestseller after 70 years (BusinessWeek Magazine's BestSeller List ranked Think and Grow Rich as the sixth bestselling paperback business book 70 years after it was first published). Think and Grow Rich is listed in John C. Maxwell's A Lifetime Must Read Books List. Over 13 hours on audio could read in half the time. Very slow talking. Very robotic. Talks way to slow way to many pauses and gaps. Okay overall good stories but somewhat outdated like talking about old basic ways of applying for jobs in the old ways. Just slow slow slow going. Not as good as I had hoped. Narrator was terrible. Pretty lame and slow moving. Does nothing to grab your attention or get you interested. The narrator lacks personality. Sounds like a robot. I really didnt like recording and voice not good. iam not able compelete this book. Extremely BORING!!! Slow and boring voice.